Our grooming shears work on large and medium dogs with thick coats. Plus, they work great as cattle, pig, and horse hair trimmers too. Whether you're new to pet grooming or are a seasoned pro, you will find the clipper's 2500 rpm frequency exceptional for the task at hand. Our portable dog and livestock grooming kit combines innovative shearing technology and high-quality materials to ensure your pet receives a snag free precision cut. The clippers' wear-resistant, extra sharp steel blades easily cut through thick fur but will not harm your pet. Our electric dog shears and livestock shears get their power via an 18.3 foot long power cord that allows for ultimate flexibility and even outdoor access as you groom your animal. Save time and money by using our thick coat dog clippers for all your grooming needs. We will also include FREE with our heavy duty dog grooming clippers an additional steel alloy blade, a machine lubricant oil bottle, and an extra set of carbon brushes. Get started today! 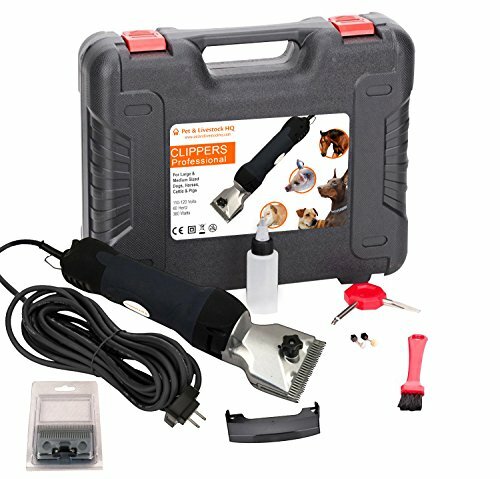 PROFESSIONAL HEAVY DUTY HOME PET GROOMING CLIPPERS FOR THICK-COATED DOGS AND LIVESTOCK - This grooming kit works on large and medium dogs (minimum height 25 inches), horses, cattle, pigs, and bovines, and is specially designed to shear animals with thick coats, fur, or hair. These clippers are the real deal, powerful & heavy duty (weighing 3.3 pounds) as used in actual grooming parlors, not the cheap under powered and lightweight variety available everywhere. USER-FRIENDLY AND SAFE ELECTRIC HAIR CLIPPERS FOR ANIMALS- Whether you're a professional dog groomer or a beginner, our clippers are an easy and safe way to groom your large or medium breed dogs and livestock. The ergonomic handle makes it comfortable and easy to grip. Their strengthened nylon polymer body reduces the vibration of our animal hair clippers so that your hand remains steady. Its two blades are durable and extra sharp but won't harm your dog or farm animals. RELIABLY BUILT WITH DURABLE MATERIALS- Our 380W heavy duty grooming clippers have a high cutting speed of 2500 rpm. To ensure they last, the motor is made of copper, which has high heat-resistance, low noise and vibration. Its strong aluminum head and blades won't overheat thanks to the device's ventilators. Designed as dog clippers for thick coats, these electric dog shears have extra sharp, alloy steel blades that remain stable and can cut through even the thickest of animal fur. INCLUDES ACCESSORIES AND CARRYING CASE- This home dog grooming kit includes our dual-blade, electric dog grooming shears with head, a clipper screwdriver, one cleaning brush, and a power cord. For your convenience, our livestock and dog hair cutting kit comes enclosed in an easy-to-carry case with designated storage areas for each item. The long power cord gives you easy maneuverability as you groom your pet. Use the carbon brush to clean your blade between uses. NO MORE EXPENSIVE GROOMING BILLS- Our Pet & Livestock HQ electric, dog and livestock hair clippers kit will reduce your monthly expenses by allowing you to take care of your pet's coat from home. We also decided to throw in another steel alloy blade, a machine lubricant oil bottle (oil included), and an extra set of carbon brushes. These items are included at no additional cost. If you have any questions about this product by Pet & Livestock HQ, contact us by completing and submitting the form below. If you are looking for a specif part number, please include it with your message.